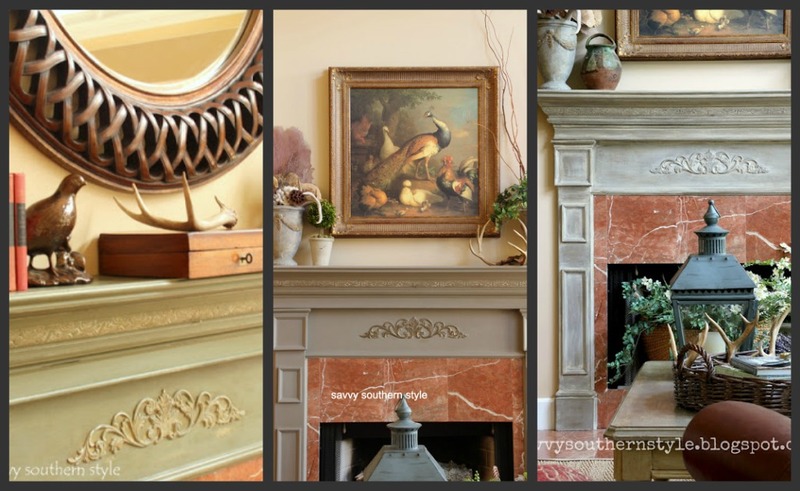 Savvy Southern Style : How Many Times? Let's look at how many times I can repaint things around here. These are few pieces I worked on this year. Just call me C R A Z Y. Mr. Savvy does all the time. This farm house stool that I bought for $8 went from Old Violet, to Antibes Green with Arles all in ASCP, and then to Tricycle Red Miss Mustard Seed Milk Paint. The buffet in the dining room went from ASCP in Old Violet to Aubusson. 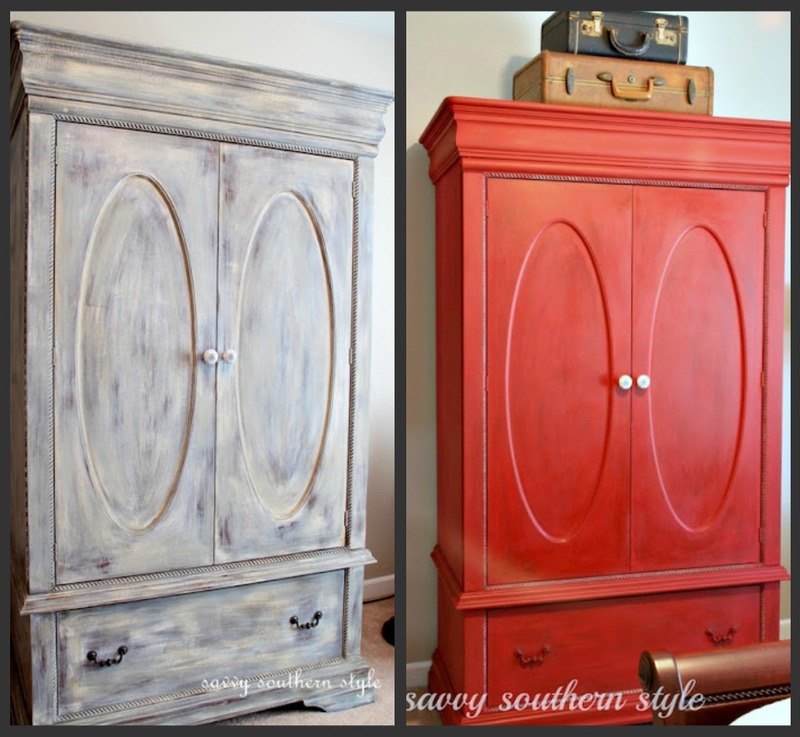 This armoire in the guest room went from a weathered finish I did last year to the new red using Primer Red chalk paint. The t.v. cabinet in the sunroom changed four times people. That's right four. It went from a very bright yellow with red striped fabric on the doors to gray with the same doors. Then the fabric came off and I painted the door panels and then lastly Mr. Savvy added beadboard to the doors. 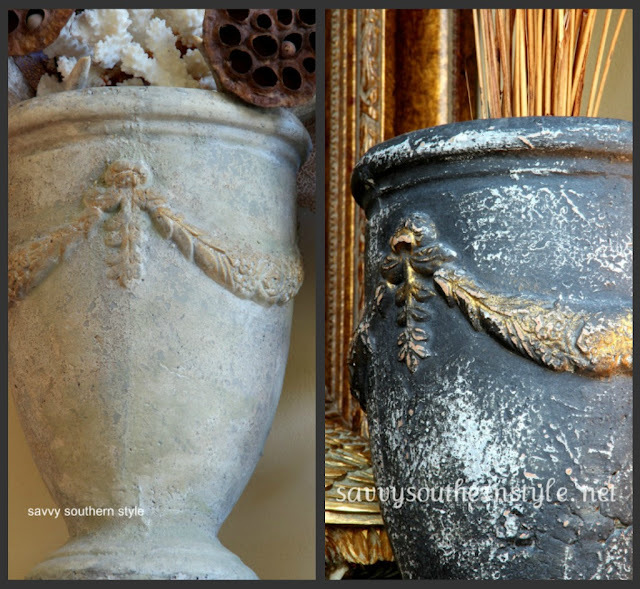 The concrete urns on the mantel were first aged with a wash of gray and then I painted them black. The mantel went from original white to Chateau Gray, to Co Co, to Co Co with a white wash over it and all paints are Annie Sloan Chalk paints. Mr. Savvy never has noticed the last change. The plate shelf that I was not going to paint ended up getting changed three times. First time it was painted with ASCP in French Linen. Second phase was a custom green with Aubusson added to the wall. What was I thinking? Third, we added beadboard to the back for a finished look and it was painted Chateau Gray ASCP. The hutch in the bathroom that had been painted red before blogging was then changed three times. The last time the doors were removed and beadboard was added to the back and an extra shelf was added. First pic colors: Old White and Chateau Gray, ASCP. 2nd pic: French Linen and St. Louis Blue, ASCP. 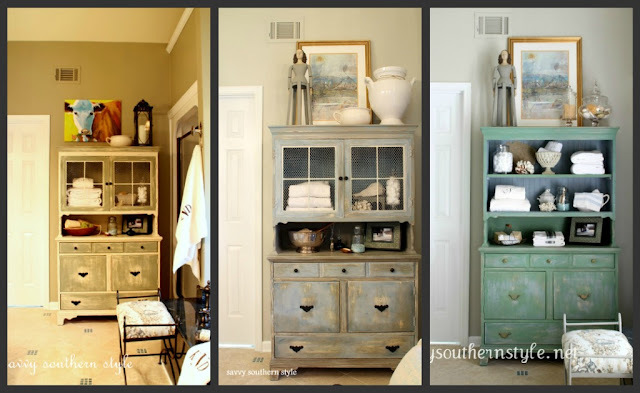 3rd pic: Luckett's Green and Shutter Gray, Miss Mustard Seed Milk paints. I have a few pieces that I am planning on painting in 2013, but most have not been painted before. I think I need to find an outlet for my madness creativity. Happy painting and Happy New Year! I love paint transformations! Its like having something new to better fit the space! You've done beautiful changes to all of your pieces! You make me feel normal. I repaint things over and over again too. I love all of your transformations, and the different colors...I really need to step out of my blue(ish) comfort zone a bit...Happy New Year, Kim! Hi Kim, It's fun to see how many times these pieces have changed! Happy New Year! LOL, Kim! That's awesome! It's so much fun to see each piece in all their colors. I have to say... that last piece... the cabinet? That's my favorite! What colors did you use on that? It's gorgeous!!!! That is too funny. As much as I paint, I don't re-do a re-do very often. 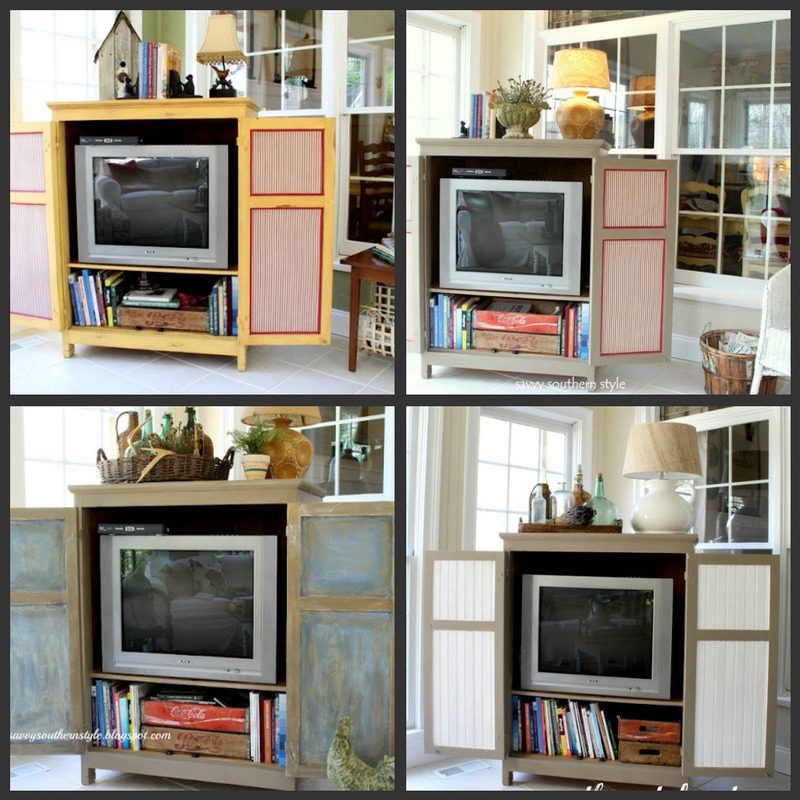 I love the cabinet in the last picture as well - all three paint jobs. there is something in your coffee!! I love it- another quality that bonds us!! Happy New Year. ps- currently I have half painted walls in the family room and my bathroom. You need to come over! I love seeing all the changes you make and I love the before and the afters on all these transformations!! Happy New Year Kim!! I love all your changes! Keep them coming! 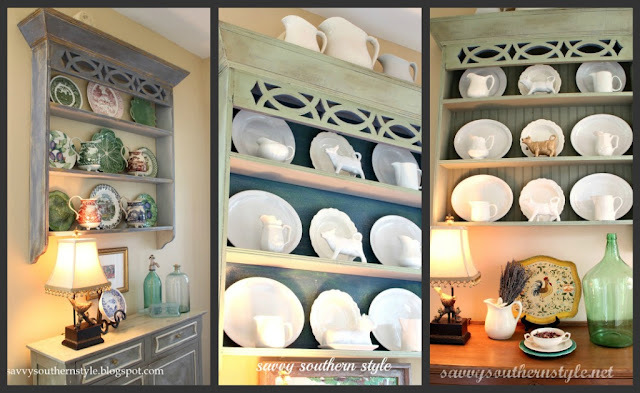 Plus, this post totally makes me feel better about making a big deal on my blog when I painted my dining room hutch white and then pretty much immediately repainted it black. My husband's expression was priceless when he got home and I told him to not go in the dining room since I was repainting the hutch...again. Thank you for sharing your "madness"...luckily it's contagious. I have a small wicker plant stand (one plant sized) that I have been struggling with what color to paint it...Tricycle Red it is thanks to your beautiful stool...now just can't wait until the paint arrives. Love all of the inspiration of colour!! Love the stool in the MMS Tricycle Red, I have a table in mind that I would love to attempt a custom finish!! I wish you and Mr.Savvy a very Happy New Year! I keep saying a paintbrush + you = magic!!! Your not crazy just creative!When you are a creative person you are always re-creating things! I am the same way! Good to keep things fresh! I agree with Anne! You're very creative! I loved each one and thought you couldn't make it better, but you did! Thanks for sharing all the inspiration! Happy New Year! Your stool has a twin sitting in our basement which my husband had in his classroom at one time. I think I may try my hands on MMS's Tricycle Red chalk paint for my first paint of 2013. I always love before and afters! Thanks for supporting my blog during it's first year, poor photos or not! I appreciate your support. Happy New Year to you & yours! I have really enjoyed watching you paint Kim. Everything you paint turns out beautiful. Lots of changes and they're all beautiful! I love the grays, the black and always red. You have a real talent for painting. Change keeps the soul young!! All your changes look great! Hope you have a great new year with lots more beautiful new projects!! My hubby thinks Im nuts too. Paint is cheap and it give something a whole new look, so paint away girl. Happy New Year! I love the befores, afters and in betweens! Keep up the madness - I mean creativity in 2013! I agree with Mr. Savvy.. however, you do put together some beautiful rooms!!.. I think you should be making the big bucks doing it, find a way! Happy New Year, Kim! You are a painting machine!! You do beautiful work! That's hilarious! hey, a girl can change her mind right? Gotta keep up with the trends! My husband says that I'll paint anything that stops moving! I think your "crazy" is normal! Too funny! Happy New Year Kim! Kim~ I wish I had your gift with a paint brush and your vision! Maybe I can ask Santa for that next year :) Love all your changes~ Happy New Year! :) Fun to see your changes! YOu need to find a shop somewhere to sell painted furniture! 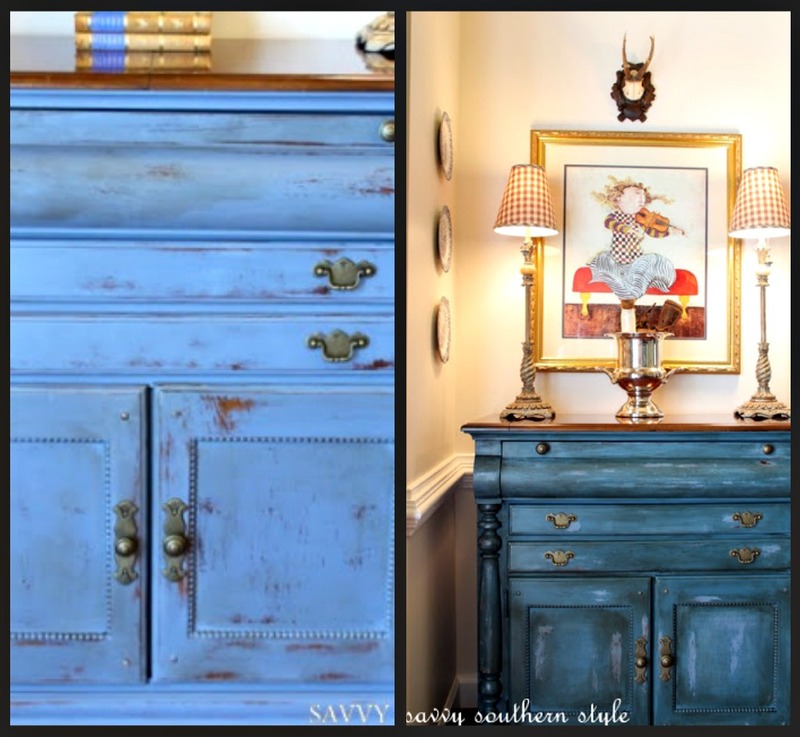 Layering paint on furniture, and I mean in a decorative way, is truly one of your many talents! I particularly love the hutch in your bathroom! That is a stunning piece, no matter what color you paint it. 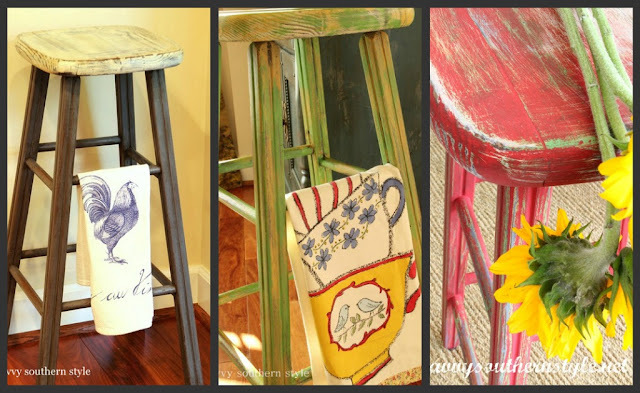 Quick question, when you painted the little stool, from green to red, did you prime it with anything in between? Looks like milk paint. Simple and sweet! Loved them all Kim! Happy New year to you my friend. Kim, it's creative madness, and few do it better than you! In fact, it was because of your buffet in the dining room that I bought a quart of ASCP in Aubusson! No, I'm not kidding. I still haven't figured out what I'm going to use it for, but if it looks half as good as your buffet, I'll be happy! Have a great new year! You do such a great job wielding that paint brush, Kim. Love.every.single.transformation! Let's continue painting and repainting in 2013, Kim! Each before and after is a chance to see your beautiful house, and I enjoy them a lot. I don't think you're crazy, but isn't the mantel due? Now that's a lot of painting! I don't have that much patience! I think all your projects have turned out great. That's so funny Kim. I am working on an angel I bought at GW for $3 and she started out brown, now darker brown, but I don't like it so I think she will be white next! LOL I can totally relate. Also, I want to tell you how much one of your photos on your home tour inspired me - the one with the Christmas sweater stocking. I sewed one yesterday (sweater from GW too) and will post about it. Thanks for all the inspirations!